A grafting robot based on cleft grafting method has been developed to improve efficiency of grafting solanaceae vegetables. This robot consists of four parts including a clamping manipulator and carrying, cutting, feeding mechanisms. These not only enable the robot to conveniently perform clamping, carrying, positioning, cutting, joining, and binding rootstock and scion, but also improve the grafting efficiency. The average success rates for cutting rootstock, cutting scion and conjugation are 98.7%, 99.0% and 59.6% respectively. The developed robot was able to perform steady operations, suggesting potential value for practical applications. Keywords: Automatic grafting, cleft graft, grafting robot, solanaceae vegetable. ©Sun et al. ; Licensee Bentham Open. Vegetable grafting technique, a vital way toguarantee stable and high yield of plants, has been widely adopted around the world. Since vegetable grafting strongly depends on timing, a time window that is suitable for grafting is usually very short and precise grafting techniques areoften required. Manual grafting can hardly satisfy these requirements due to the low efficiency, intense work loads, and low survival rates of grafted seedlings. To counteract these problems, a grafting robot has been designed to implementautomatic vegetable grafting operations, to improve the grafting efficiency, reduce labor intensity, improve the survival rates of grafts, and to facilitate the vegetable production scale and industrialization [1Y. Osamu, and F. Akiko, "Growth adjustment technique of seedling optimal for grafting by seedling storage for cucumber full-automatic machine grafting", Tokyo Agricultural Research, vol. 55, pp. 201-202, 2002.-10J.Z. Lou, J.P. Li, P.A. 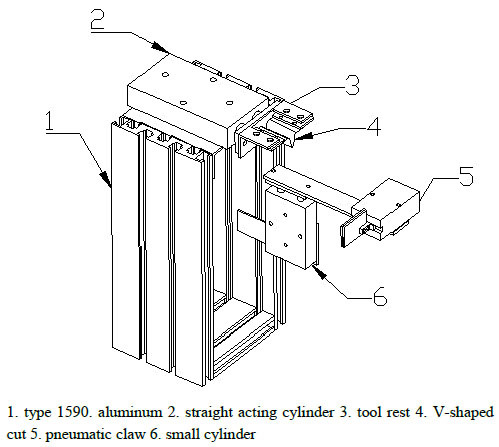 Zhu, and G. Lü, "Design and test of stock clamping mechanism for vegetable grafting", Transactions of the Chinese Society of Agricultural Engineering, vol. 29, pp. 30-35, 2013.]. For solanaceae, the grafting methods include cleft grafting, attached grafting and parallel grafting. Among these, the cleft grafting method was mostly applied in practical production due to the simplicity in operation. In the past, many reports for solanaceae grafting robot were focused on the attached and parallel grafting methods [11X. Li, J.P. Li, Z.B. 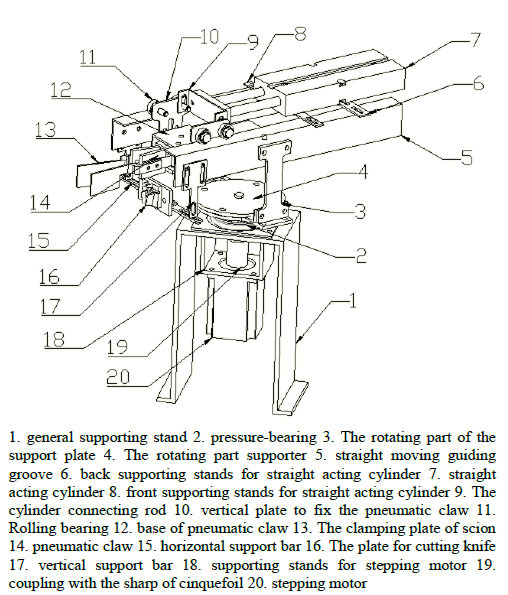 Chen, P. Zhu, and J. Qiu, "Design and test of key mechanism of beveling pin-grafting machine", Journal of Zhejiang University: Agricultural & Life Science, vol. 39, pp. 663-667, 2013., 12K. Jiang, W. Zheng, Q. Zhang, and Q. Feng, "Development and experiment of vegetable grafting robot", Transactions of the Chinese Society for Agricultural Engineering, vol. 28, pp. 8-14, 2012.]. Despite the wide utilization in growing seedling, the cutting process of cleft grafting is relatively complicated and there are still few reports about cleft grafting techniques [13Y. Zhao, Q. Sun, and T.Z. Zhang, "Mechanical system design of grafting robot for nutritional bowl eggplant seedlings", Transactions of the Chinese Society for Agricultural Machinery, vol. 38, pp. 94-97, 2007., 14K. Liu, Y.L. Yang, K. Li, Q. Chu, and L. Zhong, "Experimental study on rootstock cutting mechanism of pipeline grafting machine for solanaceae", Transactions of the Chinese Society for Agricultural Engineering, vol. 28, pp. 23-28, 2012.]. Y. Zhao [13Y. Zhao, Q. Sun, and T.Z. Zhang, "Mechanical system design of grafting robot for nutritional bowl eggplant seedlings", Transactions of the Chinese Society for Agricultural Machinery, vol. 38, pp. 94-97, 2007.] reported horizontal shoot apical meristem and vertical cleft grafting operation part with complicated design. S.B. Tian [15S.B. Tian, J.F. Yang, R.L. Wang, D. Xu, and T. Li, "Optimiza-tion experiment of operating parameters on vibration sorting-clip device for vegetable grafting machine", Transactions of the Chinese Society for Agricultural Engineering, vol. 30, pp. 9-16, 2014.] reported a kind of semiautomatic grafting machine based on multi-station pipeline system for mechanical grafting. However, the automation of this grafting machine still needs to be improved. In order to solve these problems, an automatic grafting robot for solanaceae was designed. Using this robot, holding, carrying, position-setting, cutting, jointing and seedling discharging for rootstock and scion have been successfully achieved. This paper demonstratesa grafting robot based on cleft grafting technique. Furthermore, it also provides a new approach for enhancing the efficiency of grafting solanaceae vegetables. The average rootstock cutting success rate, average scion cutting success rate and average conjugation success rate were 98.7%, 99.0% and 59.6% respectively. Nutritional pots in round shapes were used for growing scion and rootstock seedlings. The parameters of nutritional pots were measured in advance, including the height, diameters of the bottom and the top surfaces. The experiments adopted 100 Beinong eggplant rootstocks and 100 Beijing 7-leaf scionsall in their suitable grafting time. Then around the joint surface of scions measure the stem diameter Φ, height H1, height of the second main leaf H2 and height of the third main leaf H3. 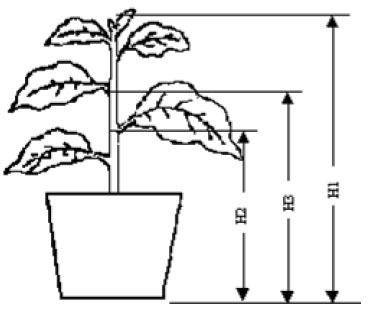 Diagrammatic sketch and relevant parameters of the eggplant seedlings are shown in Fig. (1 ) and Table 1. Diagrammatic sketch of the eggplant seedlings. Relevant parameter of the eggplant seedlings. Grafting process by hand was shown in Fig. (2a ) [13Y. Zhao, Q. Sun, and T.Z. Zhang, "Mechanical system design of grafting robot for nutritional bowl eggplant seedlings", Transactions of the Chinese Society for Agricultural Machinery, vol. 38, pp. 94-97, 2007.]. There are 5~6 leaves on the rootstock seedlings which were suitable for grafting. In addition, long and stout stem were also needed. There are 4~5 leaves on a short and thick scion. The bottom of a scion was cut in wedge with the dimension of 1.3~1.5 cm and 3 pieces of leaveswere left when grafting began. Position for cutting can be chosen at the thick part of a stem, below the second leave of the rootstock. Interface with the dimension of 1.3~1.5 cm was cut in the cross-section center in a downward direction. Wedge cut of scion can be inserted into cambium layer of the interface. 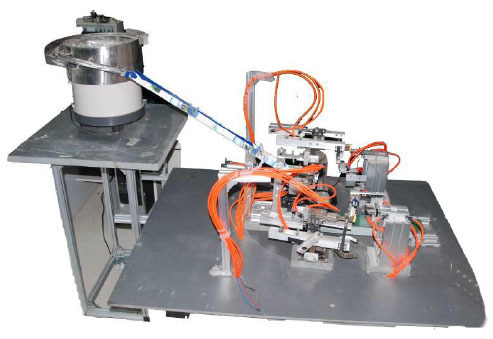 Working process of the grafting robot is shown in Fig. (2b ) [13Y. Zhao, Q. Sun, and T.Z. Zhang, "Mechanical system design of grafting robot for nutritional bowl eggplant seedlings", Transactions of the Chinese Society for Agricultural Machinery, vol. 38, pp. 94-97, 2007.]. The mechanical system of the grafting robot for handling solanaceae grown in nutritional pots mainly consists of three parts: the component for processing rootstock, the component for processing scion, and the common processing device. 3. DESIGN OF THE MECHANISM FOR PROCESSING ROOTSTOCK AND SCION. Working process of grafting robot. Diagrammatic sketch of rootstock manipulator. The grasping force can be enlarged by increasing the coefficient of friction of the finger interior surface or increasing the pressure of the pneumatic cylinder. To avoid excessive grasping force,a throttle valve was fitted on the input end andan elastic seal with high frictional coefficient was fixed on the interior side of the finger. The flow of the throttle valve can be adjusted to provide the best condition for clamping. The same configurations also apply to the rootstock seedling clamping fingers, which should avoid excessive clamping force in order to protect the rootstock seedlings. A V-shaped cutting blade was employed as the cutting knife in the experiment since the average diameter of the eggplant seedlings was 3.2 mm. To design the cutting knife plate, two vital problems should be considered, whether the seeding isholding up and if the blade can cut off the seedlings completely. Since the distance between the notch of the rootstock and the nutritional pot is larger if the seeding is not completely straight, splints were needed on both sides of a seedling to straighten the seedling. Many experiments prove that the seedlings may not be completely cut off if the splints were purely flat. In order to cut off the seedling a groove was used in the experiment so that cutting can be completed by the feeding difference tothe groove. However, position error may occur during operation of the V-shaped cutting knife due to manufacturing and shock of the mechanical parts. A suitable fuller (wider than the knife) that is 2mm deep has been designed to solve this problem. A deeper fuller may destroy the notch whilea lighter fuller cannot complete this step. Fig. (4 ) shows the schematic of the rootstock cutting mechanism. The rootstock cutting mechanism can lead the cutting blade to finish cutting accurately, and remove excessive seedlings. The cutting blade can perform forward and backward cutting movements led by a dual acting double rod linear cylinder of the rootstock cutting mechanism. The type of the cylinder was chosen to be TPMTN16*50 according to the rootstock manipulator and it can provide 100mm displacements in two directions. The useful part of the rootstock was below the notch. Liner cylinder and pneumatic claw could be used together to remove the remaining seedlings. A small cylinder 3 leads the pneumatic claw 4 to perform up-and-down movements to separate the two parts. Pneumatic claw 4 cooperates with small cylinder 3 to grab the seedlings. Schematic of the rootstock cutting mechanism. Fig. (5 ) shows the schematic of the rootstock manipulator. The function of the rootstock manipulator was to clamp the scion seedling without damaging the seedling and to carry it to a corresponding work position.A circular cylindrical coordinate was used to design the scion manipulator, which consists of horizontal manipulator and a base of the manipulator. The same structure of the scion manipulator is similar to that of the rootstock manipulator. The structural design is the same as that of the rootstock manipulator apart from a nutritional pot clamper. Schematic of the rootstock manipulator. A 57BYG250-76 step motor was employed as the electric motor. It is a two-phase hybrid electric motor with many advantages such as easy control, miniature size, high torque and small vibration. Fig. (6 ) shows the schematic of the scion cutting mechanism. The function of scion cutting mechanism was to lead the cutting knife to finish cutting accurately, and to remove the remaining seedlings. The cutting blade can perform forward and backward cutting movements led by a dual acting double rod linear cylinder. The type of the cylinder was again chosen to be TPMTN16*50. The useful part of the scion was above the notch. Straight acting cylinder and pneumatic claw could be used together to remove the remaining rod. Small cylinder 6 leads the pneumatic claw 5 to move up-and-down to finish the separation of the two parts. Pneumatic claw 5 and small cylinder 6 were used together to grab the seedlings. First, use a purchased grafting clip to arrange seedlings in order, and then carry this grafting clip to the push clamp position and hold seedlings by the clamping device. The automatic sorting device of the grafting clip is an electromagnetic vibration disc, consisting of a vibration plate, an electromagnet, an armature, a spring piece, a mounting seat, and a damping rubber pad. The pulse current produced by a controller has the same natural frequency as the system and can excite the electromagnet. The system is then led to resonance so that the armature and vibration plate will be quickly pulled to the magnet [15S.B. Tian, J.F. Yang, R.L. 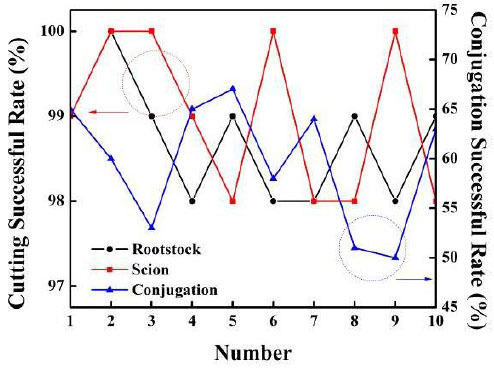 Wang, D. Xu, and T. Li, "Optimiza-tion experiment of operating parameters on vibration sorting-clip device for vegetable grafting machine", Transactions of the Chinese Society for Agricultural Engineering, vol. 30, pp. 9-16, 2014.]. Schematic of the scion cutting mechanism. The plate of guiding groove and the sliding block plays a vital role to the push and clamp mechanism. According to the tail shaped size and the chronological order, the plate of guiding groove and the sliding block were designed. The left and right sides were symmetric for the guiding groove and the sliding block. The function of the push rod was to push the grafting clip to the clamping position carefully and return to the original position. Due to the sharpness of the grafting clip, the thrust of the push rod only depends on the spring coil of the grafting clip and the cutting groove. Diagrammatic sketch of the push clamping device. The position deviation during growth and kinematic error of grafting both can lead the grafted seedling to an unsatisfactory position. The mechanism of holding up the seedlings was needed to keep the rootstock and scion pushed by the manipulator to an ideal grafting position before it was bitten by the grafting clip. According to the shape and assembling requirements of each part, the push clamping device would be obtained by assembling all parts. Fig. (7 ) shows the diagrammatic sketch of the push clamping device. 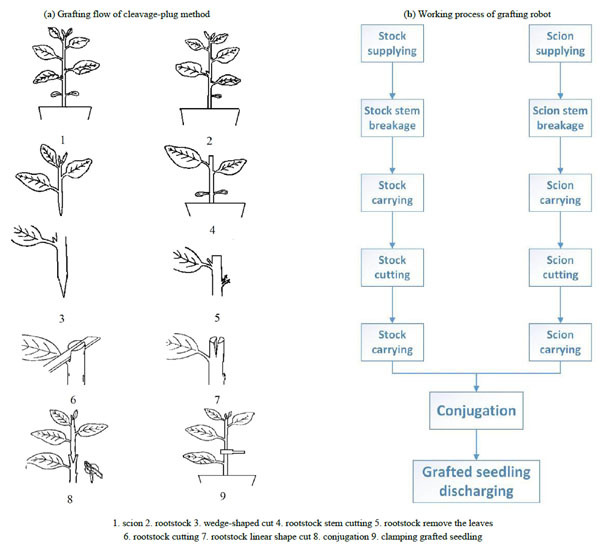 In order to convey grafted seedlings, a mechanism to discharge grafted seedlings was needed. A flat belt conveyor was employed as the conveying mechanism. The prime motor was 24V DC stepping motor, veins were needed for increasing the friction force between roller and belt core. The belt core was made of canvas. The width of the belt was decided by the diameter of the nutritional pot, while the coefficient of friction was decided by the speed of DC motor and the mass of the nutritional pot. With the driving chain, the power was conveyed to the driving roller. Fig. (8 ) shows the diagrammatic sketch of the discharging device. Diagrammatic sketch of the device for discharging grafted seedlings. The control objects include step motor, direct drive cylinder, LCD display, DC motor and so on. The control system diagram is shown in Fig. (9 ). Structure of the control system. The controller uses Arduino MCU MEGA 2560 and the hardware design is as followed. The number of the I/O signals are shown in Tables 2 and 3. The sensors include 1 micro switch and 1 approach switch, both include TTL levels. So, the front channel configurations include 2 way binary input circuit. The control system requires 1 servo motors, 2 step motors, 1 DC motor, 7 cylinder and 1 LCD module. The rear channel configurations adopt 4 way step motor control module, 7 way cylinder control module, 1 way DC motor driving module, 1 way relay control module and 1 way LCD driving module. The control system is configured with 2 way stock processor communications and 2 way scion processor communications. The functionalists of the rootstock main control module is to implement stock processing, includes stock robot hand clipping, stock moving,stock inverted ‘V’ shaped cutting. The flow diagram is shown in Fig. (10 ). The functionality of the scion processor main control module is to implement scion processing, including LCD display, scion robot hand clipping, scion moving and ‘V’ shaped cutting. 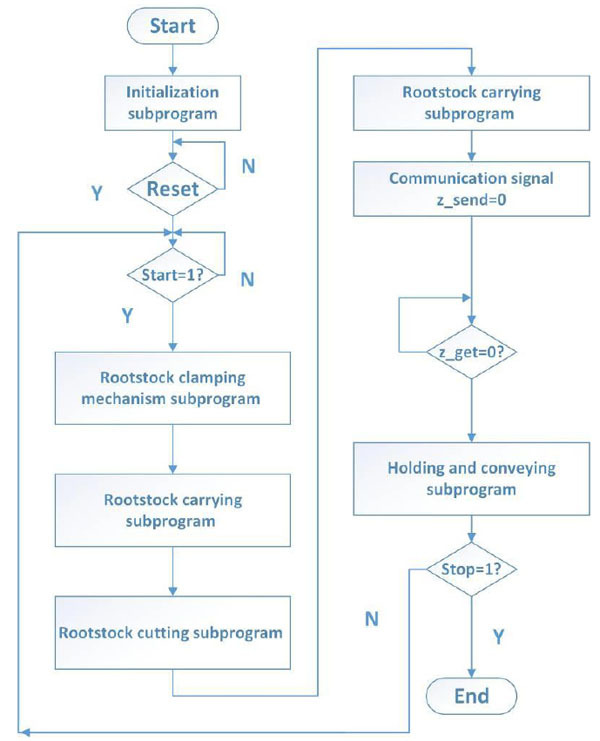 The program diagram is similar to that of the rootstock processing main control module program. (3). rootstock and scion bonding poor-rootstock and scion centring, pieced together badly with major deviation. It can be seen as successful grafting with “good” or “moderate” comment. Fig. (11 ) exhibits the prototype of grafting robot. Flow diagram of stock processing main control module. The prototype of grafting robot. The results of grafting experiments are shown in Fig. (12 ). The Results of grafting experiments indicate that the average rootstock notch and the average scion notch with a high rate of success. Due to the winding joint and the individual difference between rootstock and scion, a deviation is ineluctable for alignment of the rootstock and scion. To summarize, a grafting robot for Solanaceous vegetables has been designed according to the manual operation rules of cleft grafting. Furthermore, it also provided a new approach for enhancing and standing Solanaceous vegetables grafting efficiency. The average rootstock cutting success rate, average scion cutting success rate and average conjugation success rate were 98.7%, 99.0% and 59.6% respectively. This work is supported by the National Natural Science Foundation of China (No. : 51305239),The Natural Science Foundation of Shandong Province (No. :ZR2012CQ026), A Project of Shandong Province Higher Educational Science and Technology Program (No. : JDDLD16) and A Project of Liaocheng City Science and Technology Development Plan (No. : 2013GHZ07). Y. Osamu, and F. Akiko, "Growth adjustment technique of seedling optimal for grafting by seedling storage for cucumber full-automatic machine grafting", Tokyo Agricultural Research, vol. 55, pp. 201-202, 2002. K. Ken, S. Kenta, and S. Sadao, "Study on automation of seedlings feeding for grafting robot for cucurbitaceous vegetables (part1)-necessary accuracy for cotyledon orienting mechanism", Journal of the Japanese Society of Agricultural Machinery, vol. 68, pp. 117-123, 2006. 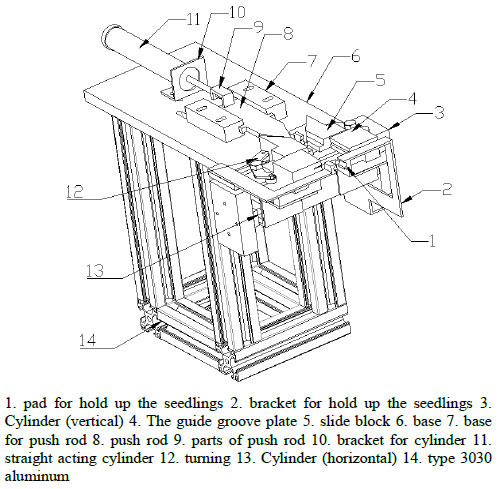 C. Kang, G. Han, T. Noh, H. Choi, and K. Youn, "Splice Grafting Robot for Fruit and Vegetable Plants", World Intellectual Property Organization, Patent WO/2005/089532, 2005. C. Kang, G. Han, T. Noh, H. Choi, and K. Youn, Splice Grafting Robot for Fruit and Vegetable Plants, Rural Development Administration: Korea, 2005. J.M. Lee, C. Kubota, S.J. Tsao, Z. Bie, P.H. Echevarria, and L. Morra, "Current status of vegetable grafting robot: Diffusion, grafting techniques, automation", Scientia Horticulturae (Amsterdam), vol. 127, pp. 93-105, 2010. C. Kubota, "Use of grafted seedlings for vegetable production in North America", Acta Horticulturae, vol. 770, pp. 21-28, 2008. Y.C. Chiu, S. Chen, and Y.C. Chang, "Development of a circular grafting robotic system for watermelon seedlings", Applied Engineering in Agriculture, vol. 24, pp. 1077-1084, 2010. Y.C. Chiu, S. Chen, and Y.C. Chang, "Development of a tubing-grafting robotic system for fruit-bearing vegetable seedlings", Applied Engineering in Agriculture, vol. 26, pp. 707-714, 2012. G.L. Lue, J.P. Li, P.A. Zhu, Q. Li, L.X. Yu, S.M. Zhu, and J.Z. Lou, "Method for rootstock position recognition based on machine vision", Journal of Zhejiang University: Engineering Science, vol. 45, pp. 1766-1770, 2011. J.Z. Lou, J.P. Li, P.A. 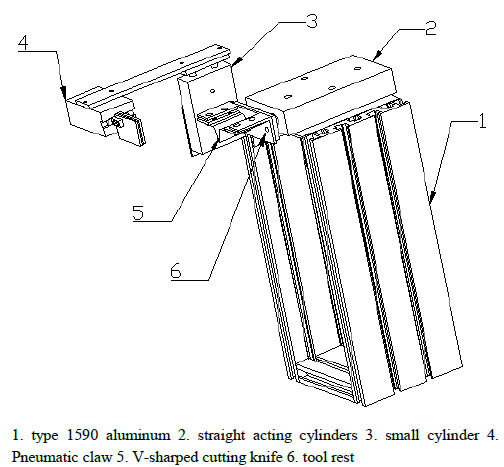 Zhu, and G. Lü, "Design and test of stock clamping mechanism for vegetable grafting", Transactions of the Chinese Society of Agricultural Engineering, vol. 29, pp. 30-35, 2013. X. Li, J.P. Li, Z.B. 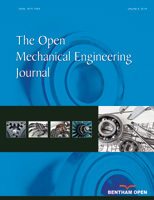 Chen, P. Zhu, and J. Qiu, "Design and test of key mechanism of beveling pin-grafting machine", Journal of Zhejiang University: Agricultural & Life Science, vol. 39, pp. 663-667, 2013. K. Jiang, W. Zheng, Q. Zhang, and Q. Feng, "Development and experiment of vegetable grafting robot", Transactions of the Chinese Society for Agricultural Engineering, vol. 28, pp. 8-14, 2012. Y. Zhao, Q. Sun, and T.Z. Zhang, "Mechanical system design of grafting robot for nutritional bowl eggplant seedlings", Transactions of the Chinese Society for Agricultural Machinery, vol. 38, pp. 94-97, 2007. K. Liu, Y.L. Yang, K. Li, Q. Chu, and L. Zhong, "Experimental study on rootstock cutting mechanism of pipeline grafting machine for solanaceae", Transactions of the Chinese Society for Agricultural Engineering, vol. 28, pp. 23-28, 2012. S.B. Tian, J.F. Yang, R.L. 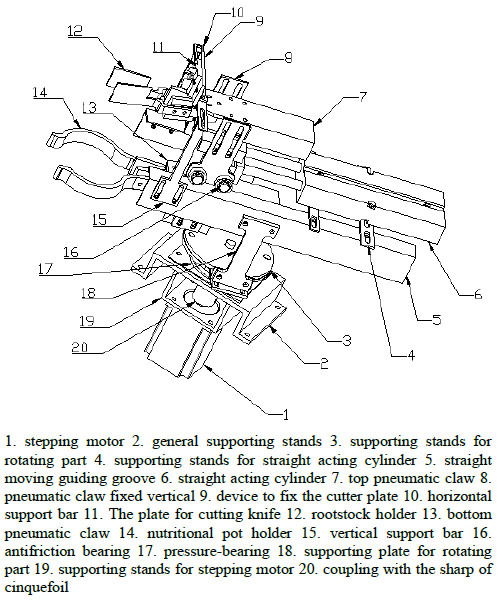 Wang, D. Xu, and T. Li, "Optimiza-tion experiment of operating parameters on vibration sorting-clip device for vegetable grafting machine", Transactions of the Chinese Society for Agricultural Engineering, vol. 30, pp. 9-16, 2014.